Need Free and Excellent Software for File Splitter and Joiner? If you have used Free online web server to upload files, then you will defiantly see upload size restriction or If you try to send large attachment in emails then you get a message saying Large File size cannot be supported. What you do on that time? the only way is by using file splitter and joiner software to split and join those files. We get so many file splitter software if we search on Google, it maybe Freeware or Premium software. Today in this post you will see one excellent and Free File Splitter software to split large files into small files easily and fast. 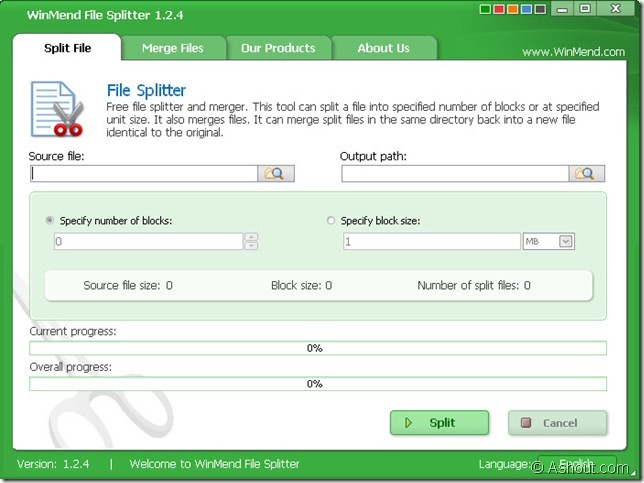 WinMend File Splitter is a free file splitter and joiner software, with the help of this software we can easily split large files like software, videos, audio and different other file types can be split. It is very small program, but works like professional software. One more thing what I like in this software is, it is easy to use and nice user interface. After doing all the above steps click Split button to split files. When you split files with WinMend File Splitter software you will see output like as shown in below image. The output contains two files, one is split files and another is *.bat file. To merge file which we have split, just run that batch file, the split file will merged/combined into one piece. So, we don’t need any software even WinMend File Splitter software to merge it. If you want to merge files using this software then try “Merge Files” tab to merge. If you are looking for best and free software file splitter, audio file splitter, avi file splitter etc., then WinMend File Splitter is for you. Pdf splitter is the software i use to split or merge pdf files. I go with HJsplit too.